An torus path is a curve on the surface of a torus that winds times around the hole and times through the hole. 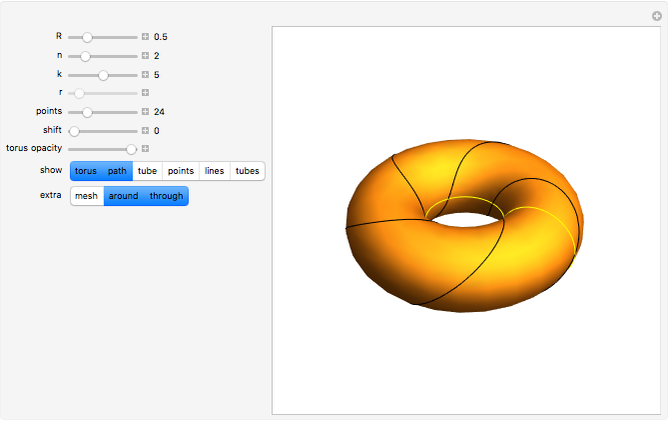 In this Demonstration you can vary the radius (thickness) of the torus and the values of and . To help understand the numbers and , you can show the extra elements "around", being a circle around the hole, and "through", being a circle through the hole. The number is the number of times the curve intersects the "through" circle, and the number is the number of times the curve intersects the "around" circle. The torus path can be thickened to a tube with radius . 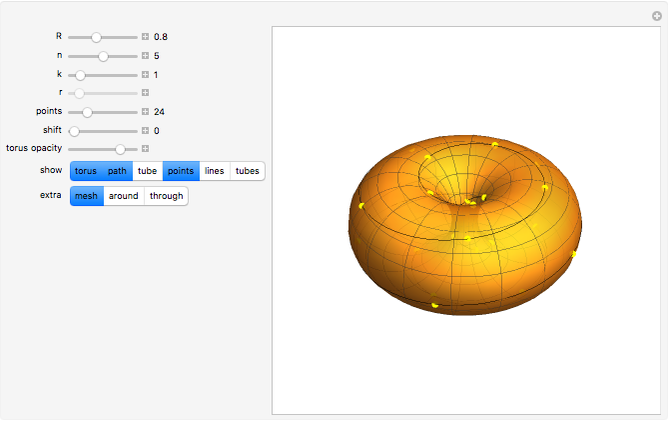 You can also show equally spaced points on the torus path, and shift the points along the path. These points can be connected by lines and tubes. A (2, 3) torus path forms a trefoil knot, and a (2, 5) torus path forms a surgeon's knot.